According to Global Workplace Analytics, 3.7 million employees (2.5% of the workforce) now work from home at least half the time. Some of these remote employees include sales and contracting, which requires frequent, sometimes long-distance traveling. 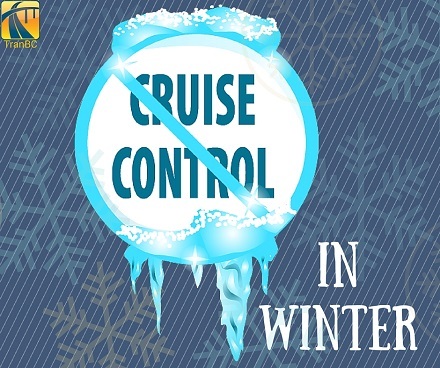 While cruise control can be an advantage to relieve stress while driving long stretches, it can be very dangerous during winter/freezing, wet weather. A driver should always have control of their vehicle and be prepared for the unknown. When cruise control is activated, it can give a driver a sense of security and they may not be on constant guard. In winter or wet conditions, a vehicle has a tendency to hydroplane, which can be damaging if proper techniques are not applied. Furthermore, the effects of hydroplaning can worsen while in cruise control mode, since to deactivate, the driver must apply the brakes. The best advice for driving in wet or freezing conditions is to disable your cruise control and decrease your speed. If you start to hydroplane, do not apply the brakes. Simply, remove your foot from the gas, grasp the steering wheel with both hands and steer toward the direction of the skid. Once you have control, you can re-center your vehicle. For more winter driving safety tips, visit the National Traffic Safety Institute.